Well, less than a week after writing this false prophecy I was on a plane for New Mexico to help director Wally Pfister, ASC - finish up his amazing first film - “Transcendence”. My role was to shoot VFX background plates, pickups and a variety of inserts. Wally is an “old school” film guy. He only shoots with Panavision cameras and anamorphic lenses, (some over 30 years old). Pfister finishes in the lab the traditional photochemical way: contact printing the original negative to an intermediate stock, (5242) and from this interpositive an internegative is produced from which the release prints are made. Wally eschews the digital intermediate process and that means - no power windows, size changes, or digital zooms. No special exposure, contrast or saturation enhancements. To him, if it isn’t in the negative, it won’t be on the screen. This is my kind of shooting as well - critical exposures via careful metering - no high definition monitors, no scopes and no third party influence. We shot interiors and exteriors on tungsten, (5219T rated at 400 asa) and daylight balanced film, (5207D rated at 200 asa). While shooting our desert day exterior scenes, it was necessary to use neutral density filters to get within the optimal F Stop range which in this case was anywhere between - 5.6 + 2/3 to 11 + 1/3. Occasionally we used a polarizer to pop the clouds and minimize glare. We had plenty of depth of field outside but when we got inside for some of the detail work - critical focus became, well – critical. The anamorphic format images the entire 4 perf 35mm frame, (excluding the sound track area.) That is over 50% more negative area than the 1:85 format and almost twice as much negative area as the spherical Super 35 wide screen format. For those of you who own a “full chip” DSLR you know that your 70-200mm zoom lens doesn’t magnify the image like you were used to with your older smaller chip camera. 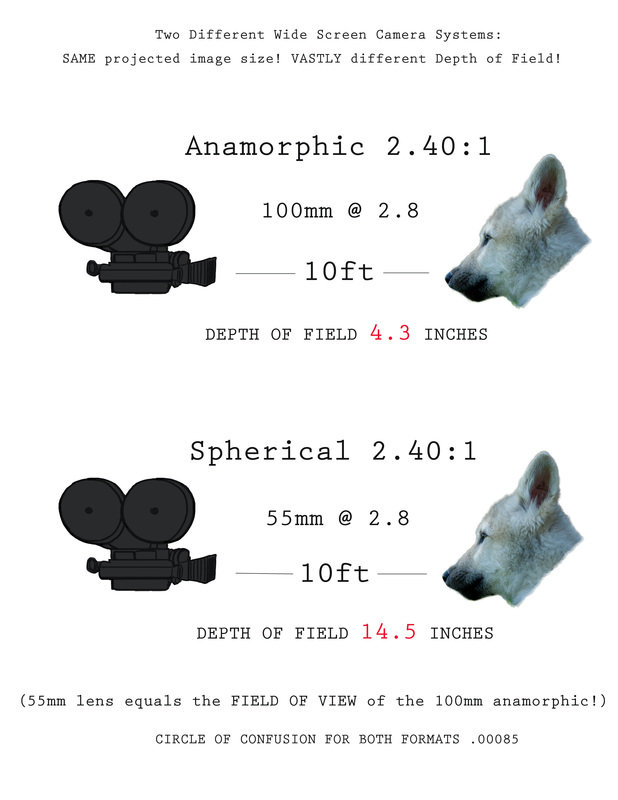 Think of the anamorphic system as a “full chip” cinema system where you need longer lenses to achieve the same field of view previously attained with a wider lens in a spherical cinema system. By definition – a smaller aperture will give you more depth of field because wider lenses are used to cover the frame. Wider lenses provide more depth of field than longer lenses. So with the anamorphic system, focus pullers have to sweat even more because in a sense, they are working with “telephoto” lenses for basic film scene coverage. For technical specification, refer to the ASC manual discussion of Aspect Ratios, Circle of Confusion and Aperture Sizes. (See accompanying chart). I really enjoyed working with my friend Wally, a wonderful collaborator, a great talent and a true filmmaker.